It was Armistice Day 1921. The holiday celebrating the end of the World War that had ended just three years previous. This year’s celebration would be special — a new monument would be dedicated, the Tomb of the Unknown Soldier. President Harding would lead the ceremonies at Arlington Cemetery. The casket of the unknown soldier had lain in the Capitol Rotunda since Memorial Day and would be ceremoniously brought to the cemetery for interment. A new memorial had been built, not far from the monument to the unknown soldiers of the Civil War, dedicated 50 years earlier. All the great and the good would be in attendance — everyone who was everyone. Former president Woodrow Wilson made his first public appearance since leaving office riding in the funeral cortege from the Capitol. The ceremony would receive front page coverage from all of Washington’s newspapers — the Herald, the Evening Star, the Washington Post, the Washington Times. Attendance was so heavy that the august occasion was almost spoiled by the crush of traffic crossing the Aqueduct and Highway Bridges from Washington to Arlington. President Harding arrived mere minutes before he was due to speak. The traffic tangle was inevitable. Washingtonians were early and enthusiastic adopters of the automobile. The vision of a memorial bridge across the Potomac uniting North and South might be said to have originated with Daniel Webster in 1851. Webster authored a convenient fiction, crediting President Andrew Jackson with the idea. Jackson did advocate building a bridge across the Potomac, but his was the reconstruction of the existing Long Bridge damaged by floods in 1831. Jackson did participate in the re-opening ceremonies in 1835, walking from Washington to Virginia (and riding back). Yet Long Bridge had always been strictly utilitarian and in no way symbolic, monumental, or memorial. 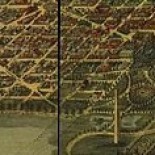 This entry was posted on June 27, 2016 by dchistorystuff in Architecture, Arlington County history, Arlington Memorial Bridge, City of Washington, Civil War, DC History, Foggy Bottom, Infrastructure, Maps, Potomac River, Streets, Transportation history, Unbuilt Washington, Washington DC, Washington DC architecture, Washington DC memorials, Washington DC monuments, Washington DC planning and tagged Arlington Cemetery, Arlington Memorial Bridge, Commission of Fine Arts, D.C., District of Columbia, Foggy Bottom, Grant Memorial Bridge, Jackson City, Maps, Potomac River, Tomb of the Unknown Soldier, Washington DC, Washington DC history.